Magnet Resonance Imaging (MRI) machines require large magnets to produce a very large linear field over a specified volume. Unlike most magnet simulations, the field accuracy has to be extremely high. For practical problems, this may mean field calculations with error in parts per million. This accuracy is met by using boundary element method. Unlike finite element calculations, a potential is not differentiated to get the magnet field because this leads to large numerical inaccuracies. Instead, the real and equivalent sources are integrated to yield extremely high accuracy. In addition, the software can be used for stringent room shielding requirements. Magnetic Resonance Imaging devices have two major components. The largest being the magnet required to produce the DC magnetic field. 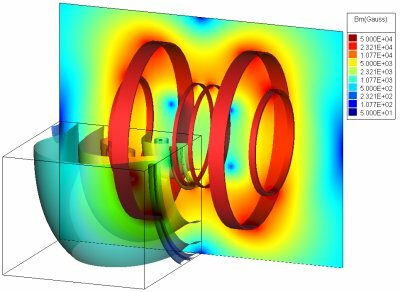 As most of these problems are full 3D simulation, AMPERES would be required to model the magnets and analyze the design. The RF or radio frequency required to energize the hydrogen molecules would require a time-harmonic electromagnetic analysis. SINGULA would be the simulation software for this analysis.